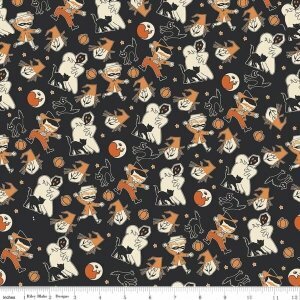 Penny Rose Fabric Trick or Treat line by Carta Bella. Pattern C 5991 Black. Ghost, witches, black cats, moon and trick or treaters in oranges, cream and black on a black background. 100% cotton, machine wash cold.